With orange flowers and lemon scented foliage Darwinia citriodora is commonly called the Lemon Scented Myrtle. It is the prostrate form that is popular and it grows well in coastal conditions. The growth habit is best described as mound forming and in landscaping it can be used as a stand alone plant in the garden, or mass planted as ground cover. The leaves are small as are the flowers, however it is a very attractive ground cover plant both in and out of flower. 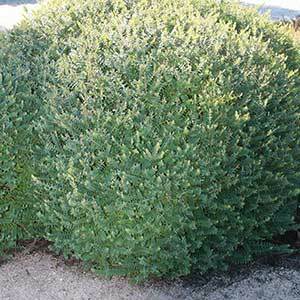 The taller form can be used as a low hedging or border plant. The prostrate form is suited to container growing, and the aromatic foliage makes it great for near outdoor living areas. It will attract birds and bees, including the native bees to the garden. The rootstock of this hardy species is often used to graft less hardy species such as D. macrostegia. Height – To around 1 metre, the prostrate form is lower growing to around 1/2 this height..